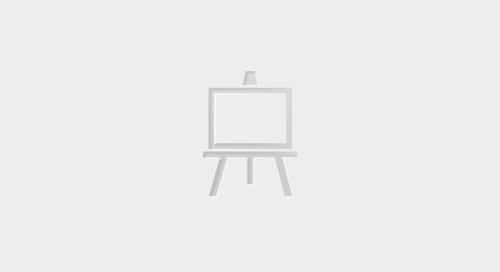 Designed for simplicity, reliability and speed, Natural is the environment of choice for enterprises operating large-scale OLTP applications on the mainframe. 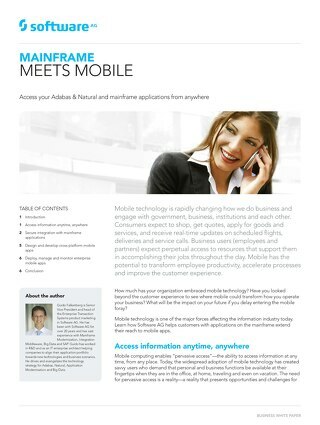 See how to break free from the high cost of the mainframe and legacy UNIX® without the risks of rip & replace. Read these five rehosting success stories for Adabas & Natural. 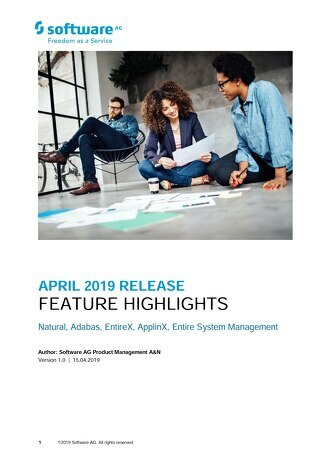 Read about 2019 enhancements to Natural, Adabas, EntireX, ApplinX and Entire System Management. 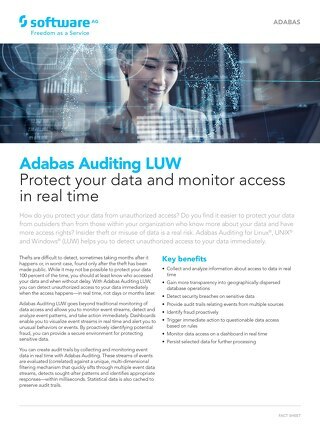 Detect unauthorized access to your data immediately with auditing for Adabas database management system for LUW. 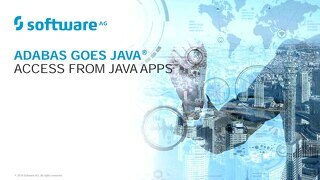 Give Java developers and software designers the ability to process data stored in Adabas with Java through a RESTful interface. Quickly develop and deploy the enterprise applications business users demand with the Natural application development platform. 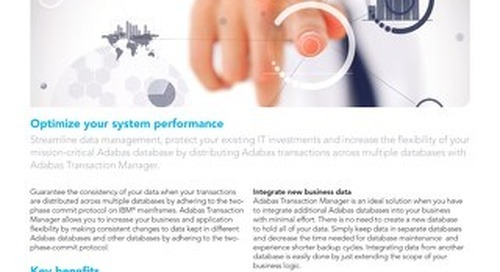 By distributing Adabas transactions across multiple databases, you can improve the performance of your mission-critical Adabas database. 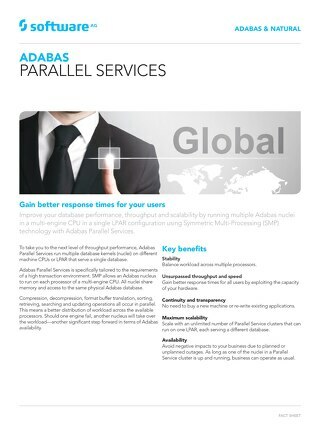 If your applications need better response time, then Adabas Parallel Services is for you. 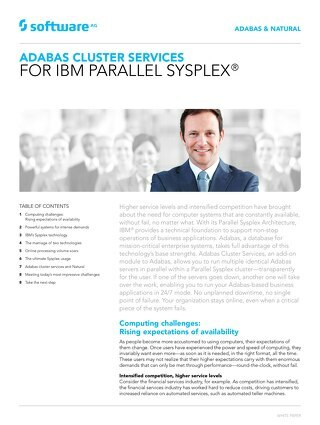 Adabas Cluster Services, an add-on module to Adabas, allows you to run multiple identical Adabas servers in parallel within a Parallel Sysplex cluster. Enable administrators to save & restore only the changed portions of the database, saving up to 90% of a DBA‘s time and resources on backup functions. 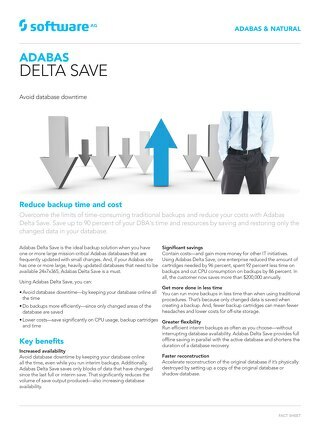 With Adabas Vista, you can divide a large volume of data across many files to simplify maintenance, increase availability and store data where it’s needed the most. 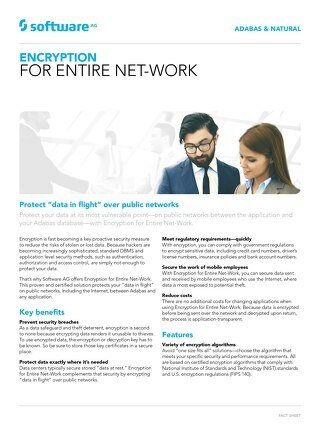 Protect "data in flight" over public networks. 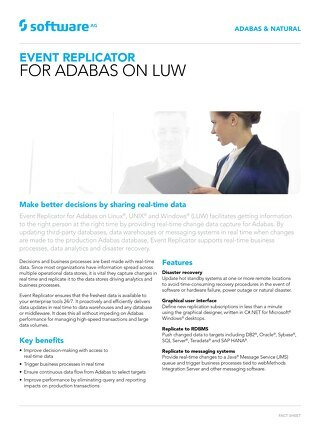 Make better decisions by sharing real-time data when you use Adabas on Linux®, UNIX® and Windows® platforms. 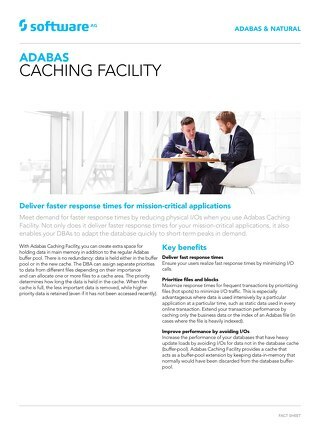 Meet demand for faster response times by reducing physical I/Os when you use Adabas Caching Facility, an add-on product for Adabas for the mainframe. 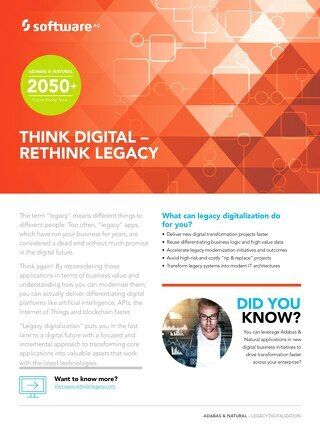 “Legacy digitalization” puts you in the fast lane to a digital future with a focused approach to transforming core applications into valuable assets that work with the latest technologies. Deploy Adabas & Natural applications without change to containers and the cloud. See how. 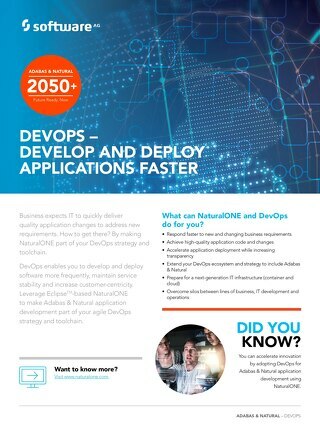 Accelerate innovation by making NaturalONE part of your DevOps strategy and toolchain. See how. 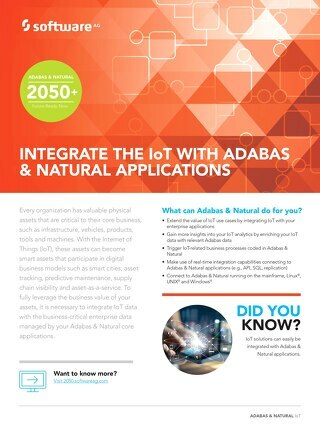 Integrate IoT data with business-critical enterprise data managed by your Adabas & Natural core applications. See how.